“We are often afraid to be alone, yet all we really have is ourselves at the end of the day. I grew up with a paranoia that I would never feel at peace inside. I was always searching for connections…always in the wrong places and with the wrong people. Living in conflict with yourself is claustrophobic…it’s like a pressure cooker waiting to erupt. Two years ago I chucked in my job, and bought a one way ticket to Europe with savings. I thought I’d ‘find myself.’ Such a cliche, but I kinda did. I was sitting on a sleeper train travelling through Italy, and it was hot. I couldn’t sleep and so just sat staring out at the window. It was dark, so not much to see, but I just felt OK in being in my body. 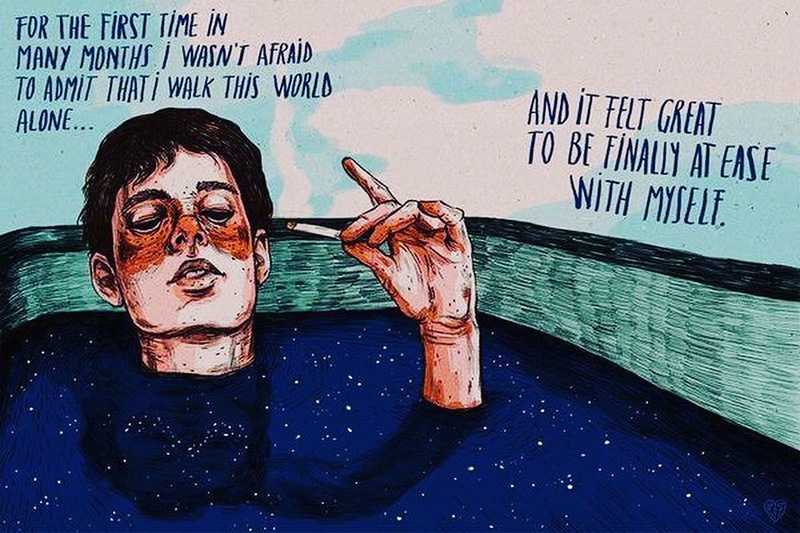 No one else around, it was a strange feeling…like I had almost accepted my place in the world. When I stopped ‘trying’ life became a whole lot easier. I continued travelling until Christmas just gone and I met some amazing people who I’m in constant contact with.